Football is a pretty good way to achieve that. 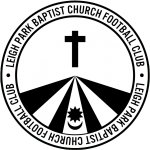 LPBC FC is a community football club that practically embodies the holistic values of Leigh Park Baptist Church by being totally inclusive to all men; giving them an opportunity to belong to a team, improve their fitness, develop mature personal and social skills as well as footballing ability. For younger men we aim to provide a positive male role model within the community. We aim to create a positive environment in which to get to know each other and enjoy our football together. Match Days: Saturday (Kick Off 10:30am), Meet at the church at 9am. 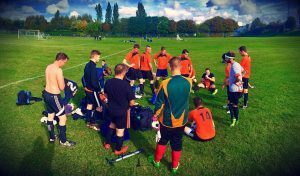 The purpose of LPBC FC is, using football as a vehicle, to engage with men in the local community and demonstrate God’s love for all people and care for the whole person. The club is inclusive regardless of one’s social or ethnic background, sexual orientation or religious beliefs. All those involved in the team are asked and expected to respect the Christian ethos of the team and the Solent Churches Football League. Training and match days all involve prayer and a reminder that each man represents the church and therefore personal conduct should suitably reflect that. We also aim to foster a positive, affirming and encouraging atmosphere in which to enjoy our football. Players signing on for the season also sign up to the clubs Code of Conduct ensuring everyone is aware of, and carries out, their personal responsibilities as part of the club. As part of the team, the men are viewed and valued as part of the church community, and as such are invited to partake in all church events and services including community fun days, Christmas services, small groups and regular services. The club is run under the oversight and with the full support of the LPBC Leadership Team.